1/27/1990, Albert Coya/Miami Herald Staff: Dr. Martin Luther King Jr. Oratorical presentations contest. Winner of Jr. High category was Torrey Holmes, from Richmond Heights Middle School. 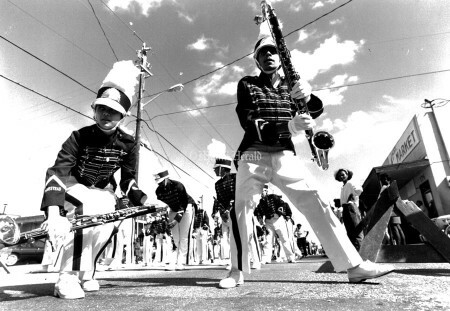 1/23/1986, Murry Sill/Miami Herald Staff: David Manford leads Temple 149's oriented band. 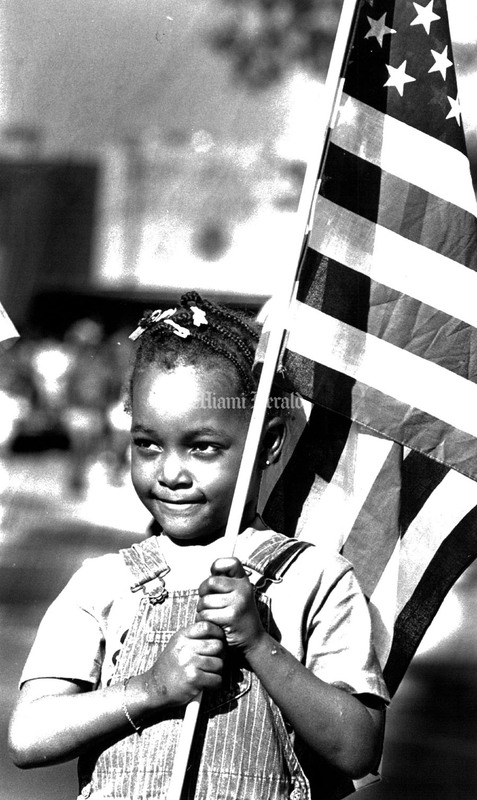 1/16/1990, Miami Herald Staff: Martin Luther King holiday. 1/15/1989, Mike Stocker/Miami Herald Staff: 8-year-old Quiana Edgecomb holds a picture of Martin Luther King as she marches in the parade. 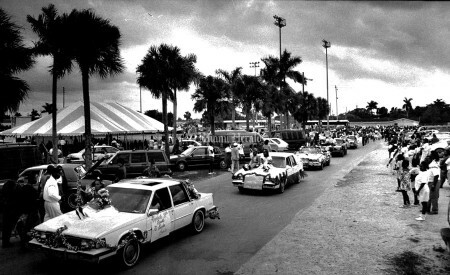 1/21/1988, Peter Andrew Bosch/Miami Herald Staff: 80,000 people showed up for the Dr. Martin Luther King parade on MLK Blvd. 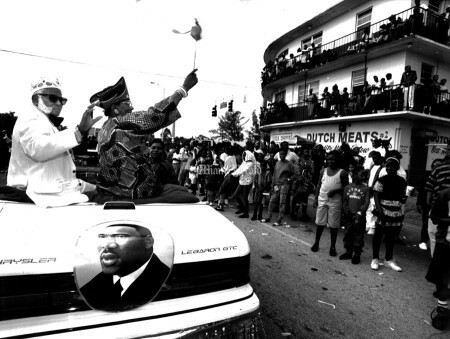 in Liberty City. 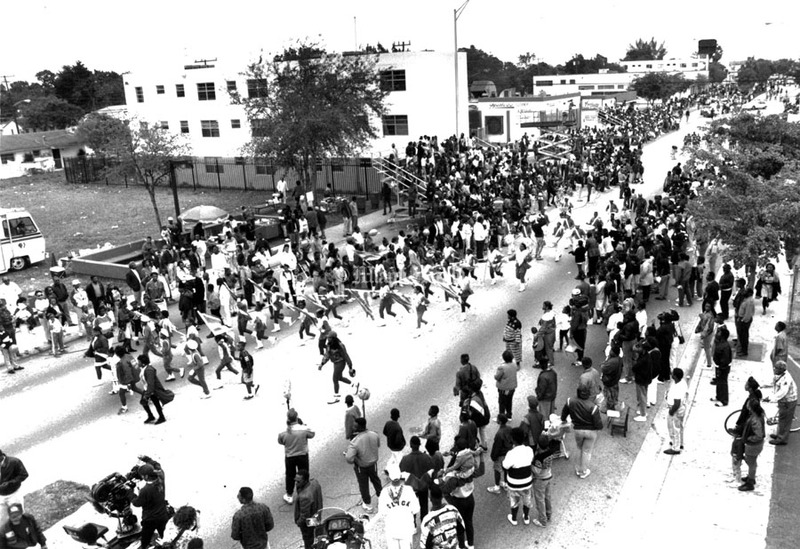 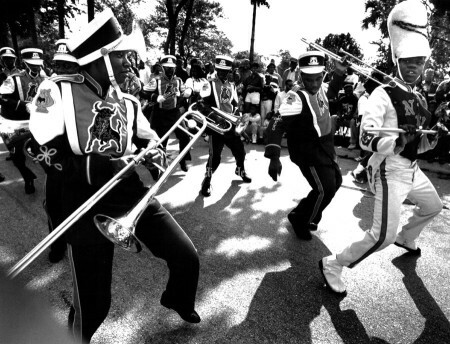 1/19/1992, Bill Frakes/Miami Herald Staff: Homestead High band dances through the Martin Luther King Jr. parade route. 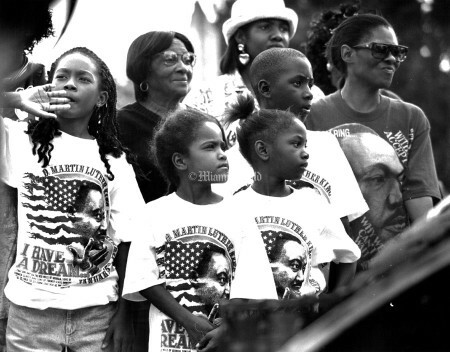 1/21/1992, Miami Herald Staff: Martin Luther King holiday. 1/18/1988, Marice Cohn-Band/Miami Herald Staff: Phyllis Hines, 23, waves to crowd from hood of a car during Martin Luter King Jr. parade. 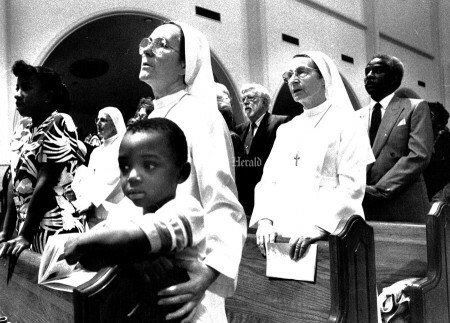 1/15/1990, Tim Chapman/Miami Herald Staff: Sister Germana holds Philip Dawkins during Martin Luther King Day mass at St. Mary's Cathedral. 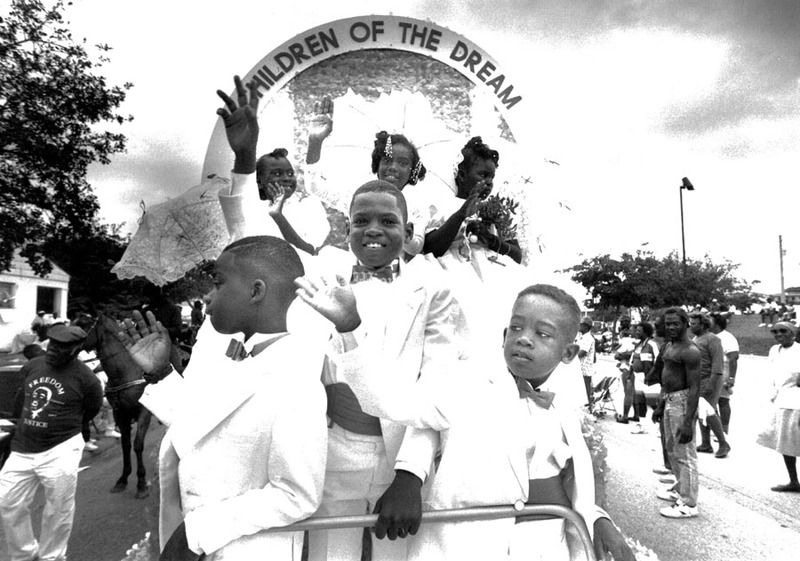 1/19/1991, Andrew Innerarity/Miami Herald Staff: 4 year old students from the Florida City Head Start program, Terrell Howard (left),and Treneil Stevens, wave from their float during the parade today honoring Dr. Martin Luther King Jr's birthday. 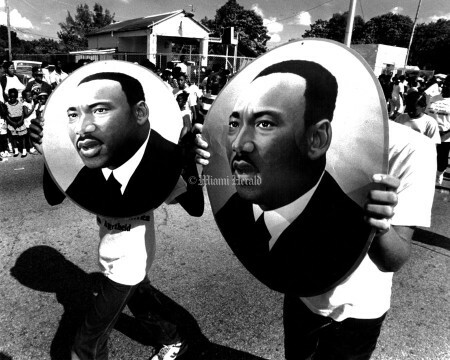 1/20/1986, C.W. 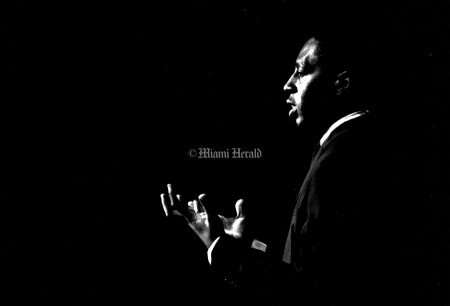 Griffin/Miami Herald Staff: Frances Brown reading from accounts of Dr. Martin Luther King during a tribute at the Gibson Center. 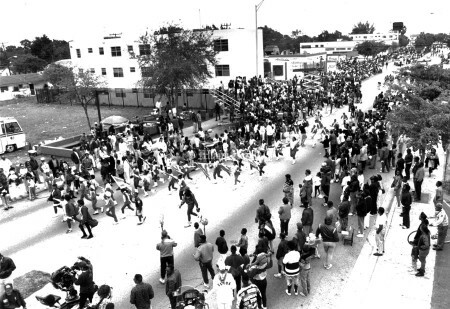 1/17/1994, Al Diaz/Miami Herald Staff: Annual Martin Luther King Parade. Maricesa Martindale, 9, Erskaneshia Ritchie, 6, Shevika Martindale, 6, Erskine Ritchie, 8 watch the parade. 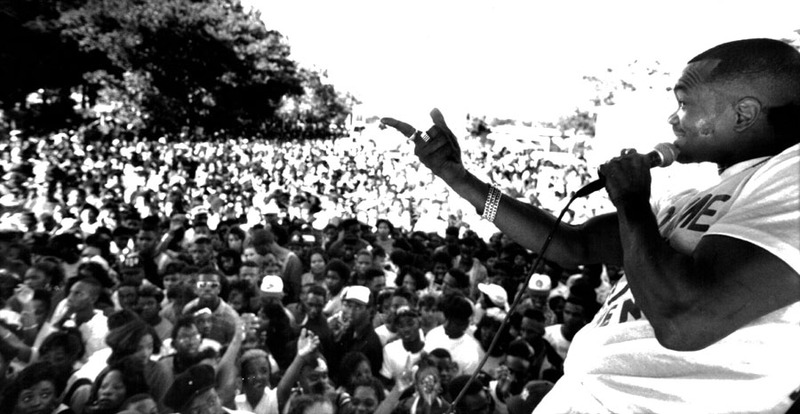 1/14/1984, Bob East/Miami Herald Staff: Martin Luther King Jr. day in West Perrine at Ben Shavis park. Ed Williams and Nellie Yates are BBQ'ing. 1/16/1988, Raul Rubiera/Miami Herald Staff: 9 year old Jeneka Morris counts the stars during the Martin Luther King Jr. celebration at West Perrine Park. 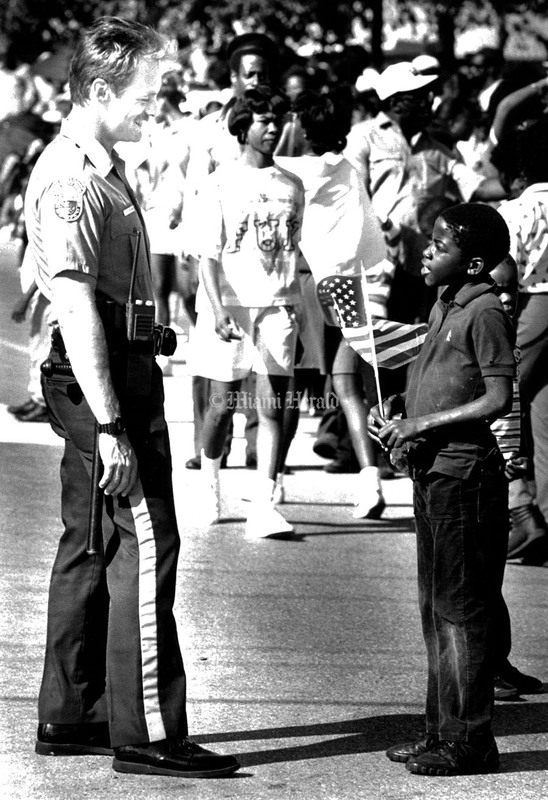 1/21/1988, Peter Andrew Bosch/Miami Herald Staff: Metro Dade Officer Eric Schottenheimer talking to Ziebia Porinsa before the MLK parade in Liberty city. 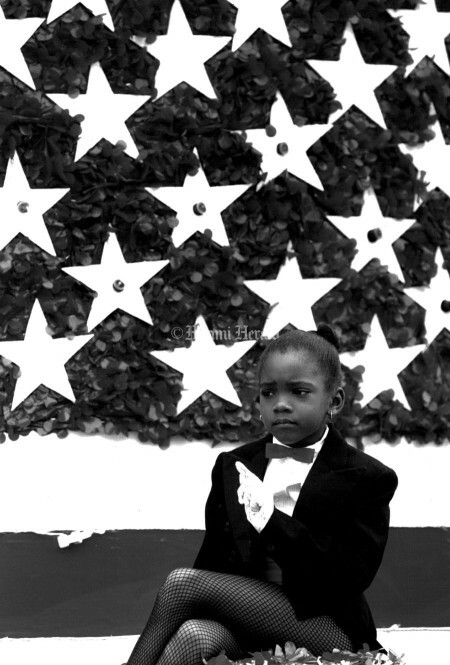 1/14/1988, Jon Kral/Miami Herald Staff: Kenton Dopson,7, of the Singing Angels reading from a Martin Luther King book to an audience that came to the park for a wreath-laying to mark M.L.K's birthday. 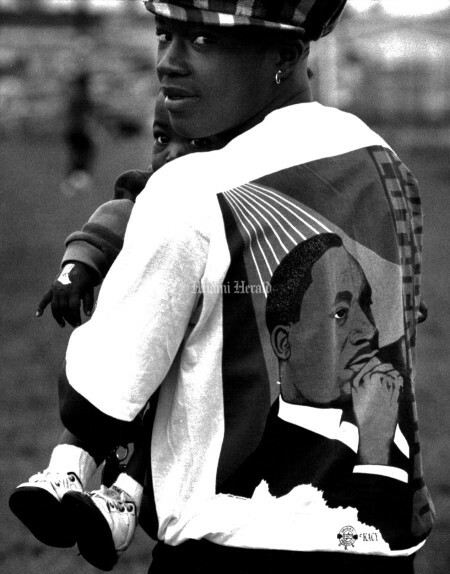 1/16/1993, A. Brennan Innerarity/Miami Herald Staff: Morrie Bryant wears his MLK shirt while he holds his son, 14 month old Jerrell Lott whom he had brought to see the parade honoring Dr. Martin Luther king Jr.
1/20/1992, Andrew Innerarity/Miami Herald Staff: A group of Haitians, protesting US government immigration policy brought up the tail end of a parade honoring Dr. Martin Luther King's Birthday this morning in Miami. 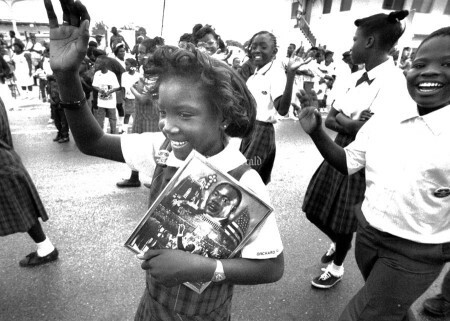 1/16/1989, Raul Rubiera/Miami Herald staff: Callie Miller from Richmond Heights enjoys the Martin Luther King Jr. celebration. 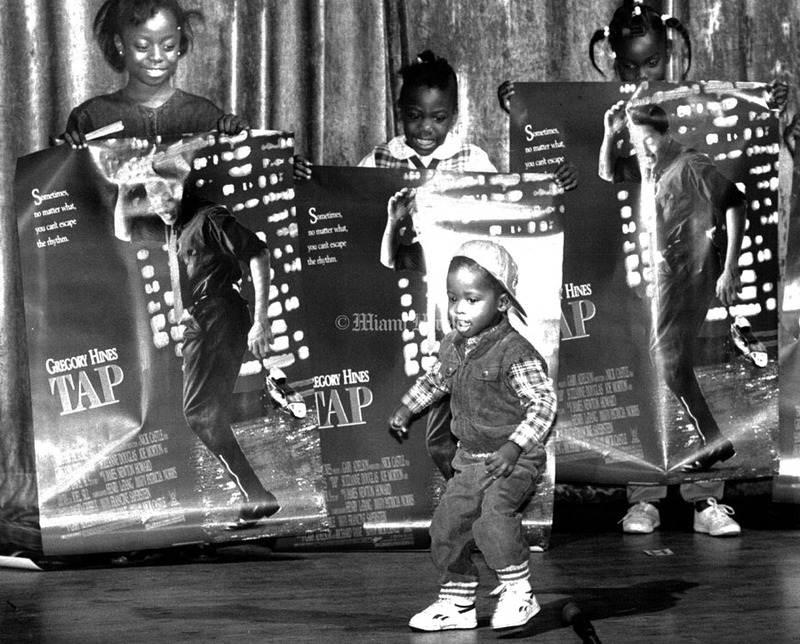 1/9/1989, Marice Cohn Band/Miami Herald Staff: Two year old Tony Brown makes his debut on stage when Steve Zimmerman invited kids at Magic City Monday at the Caleb Center up on stage to ask him questions. 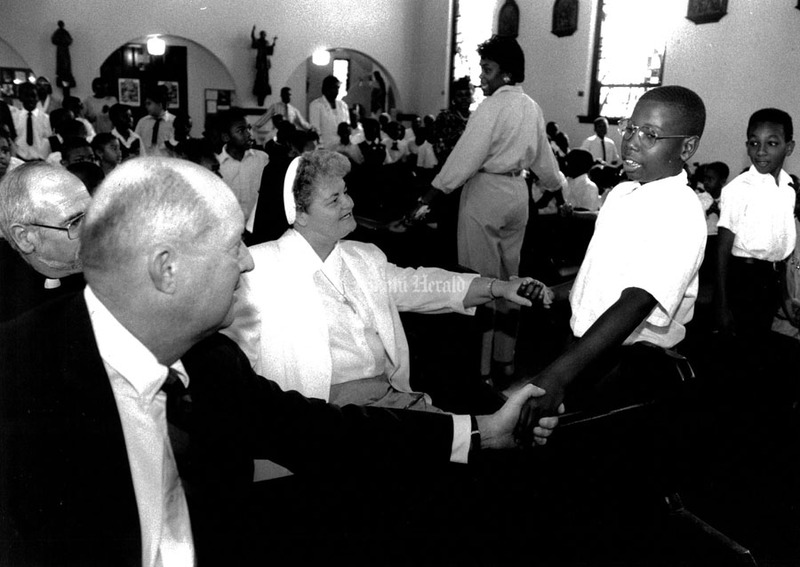 Zimmerman, a tap dancer, was the special guest artist from the program honoring Martin Luther King Day. 1/20/1986, Murry Sill/Miami Herald Staff: Watching the parade in honor of Martin Luther King are Near Martin and Morris Copeland. 1/19/1991, Andrew Innerarity/Miami Herald Staff: The crowd as the parade for Martin Luther King Jr. winds down in Homestead this afternoon. 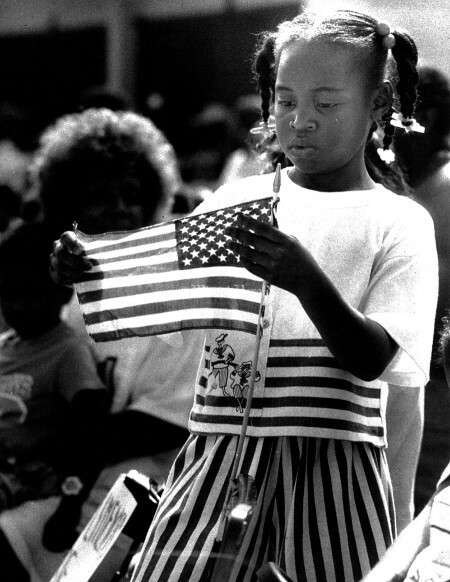 1/21/1988, Peter Andrew Bosch/Miami Herald staff: Rosa Grantholds the American flag while she watches the M.L.K. parade in Liberty City. 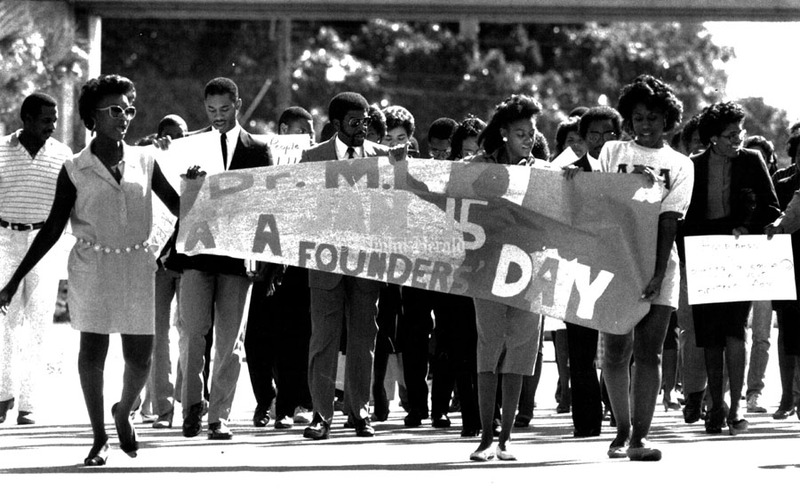 Undated, Erica Berger/Miami Herald Staff: Black students march at UM in honor of Martin Luther King birthday. 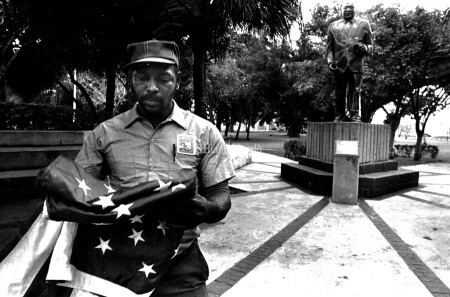 1/14/1988, Peter Andrew Bosch/Miami Herald Staff: J.C. Williams of Metro-Dade park unfolding the flag at the Dr. Martin Luther King Jr. Park in Liberty City. 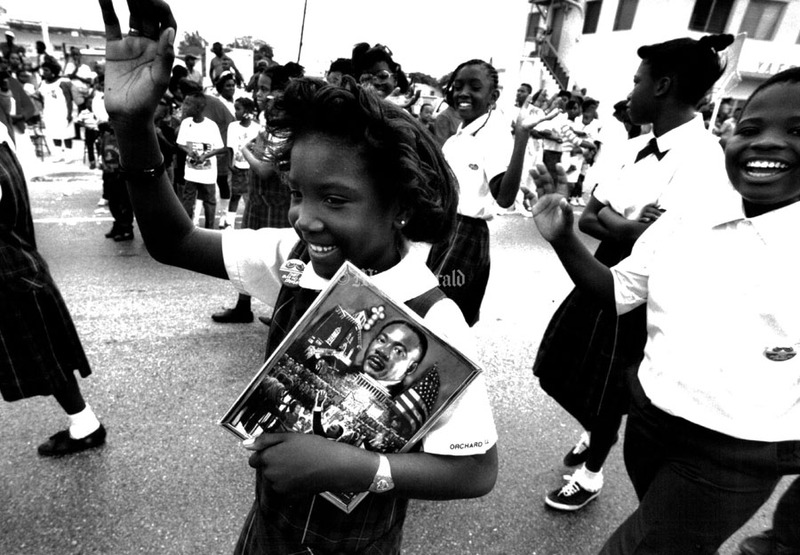 1/17/1994, Al Diaz/Miami Herald Staff: Annual Martin Luther King parade; Edward Cross and Ada Manuel wave to the crowds during parade. 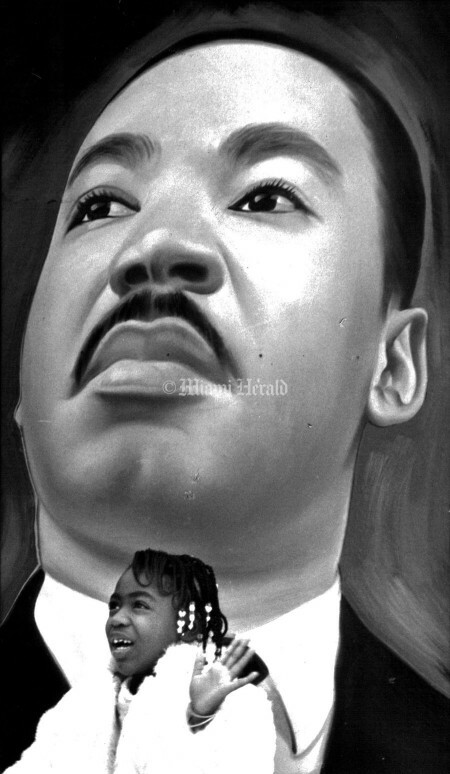 1/23/1986, C.W. 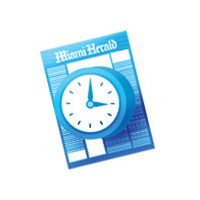 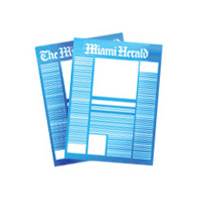 Griffin/Miami Herald Staff: Martin Luther King holiday. 1/6/1983, Robin Shields/Miami Herald Staff: Joseph Gillyard conducting the student band. 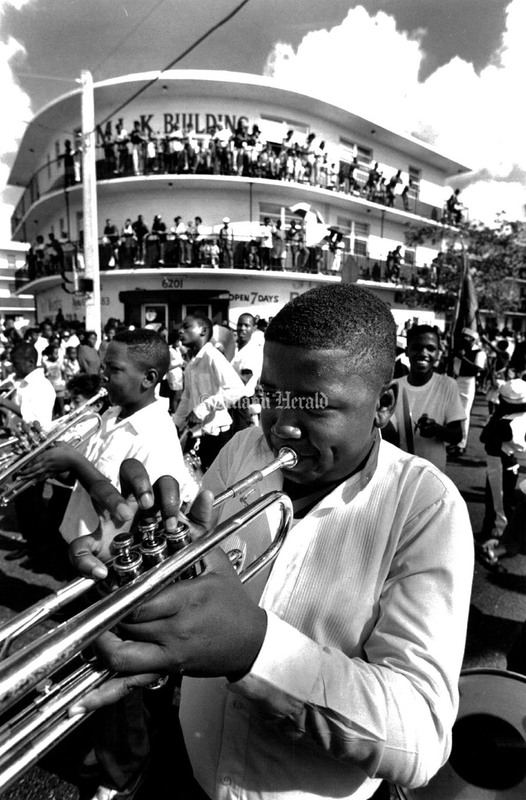 He is cueing the drum section. 1/16/1993, Alex Gort/Miami Herald Staff: Father Gerard LaCerra chancellor for the Archdiocese and sister Noreen Werner, superintendent of schools for the Archdiocese holds hands with 5th grader Jason Brown as all the children sang a song about Dr. Martin Luther King. 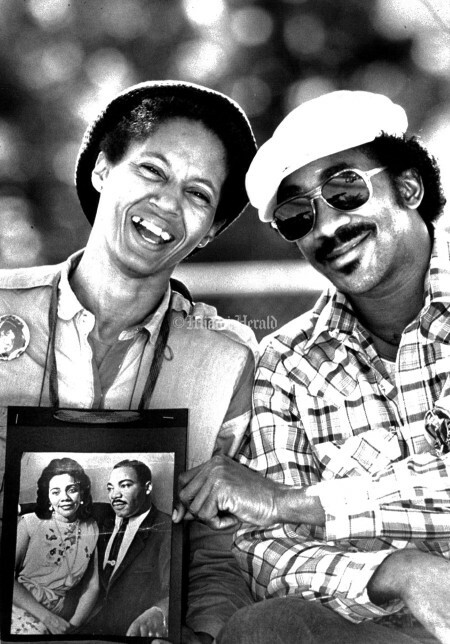 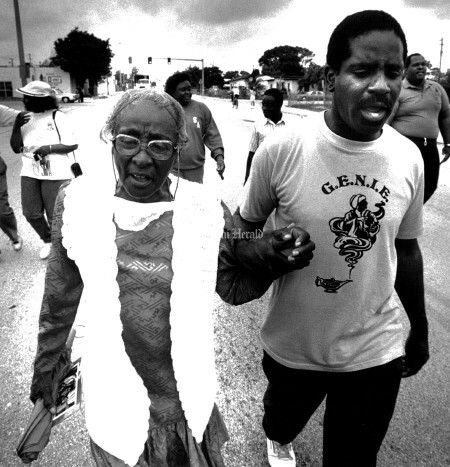 1/21/1991, Walter Michot/Miami Herald Staff: Myrtle Ross and Fred Williams walk hand in hand and sing during the MLK parade walk. 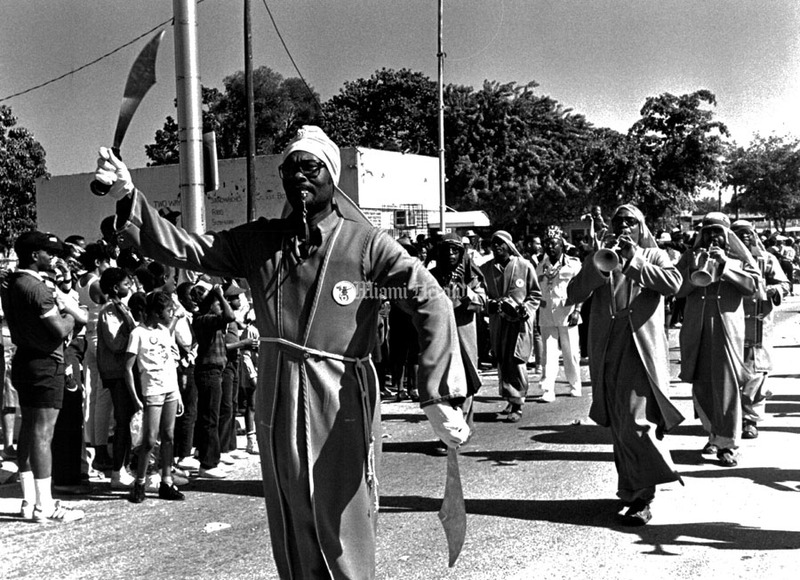 Undated: Martin Luther King day parade. 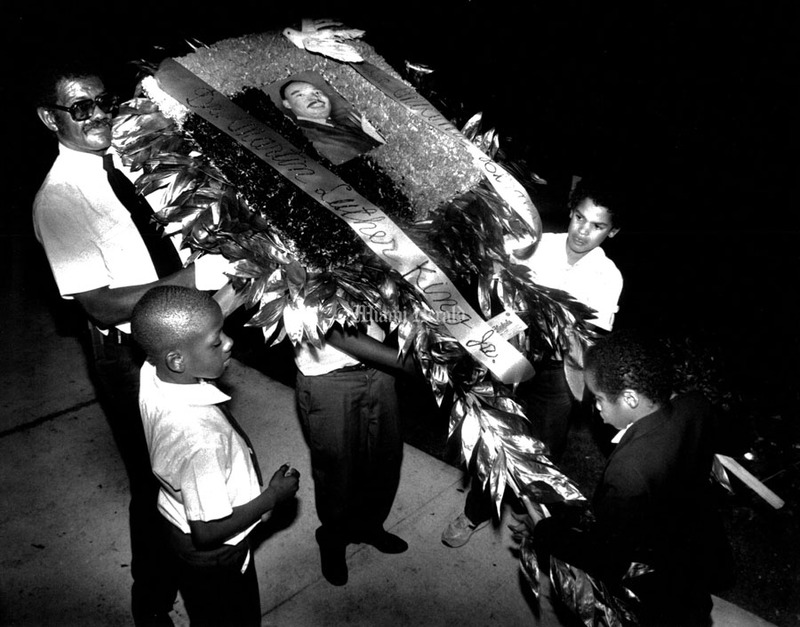 1/13/1989, Candance Barbot/Miami Herald Staff: (L-R) Col. William Edwards (adult), Maurice Brown, Michael Saunders and Marc Parker brought in the special Martin Luther kKng, Jr. wreath which was placed in front of King's statue at the park during a small ceremony to acknowledge the upcoming holiday. 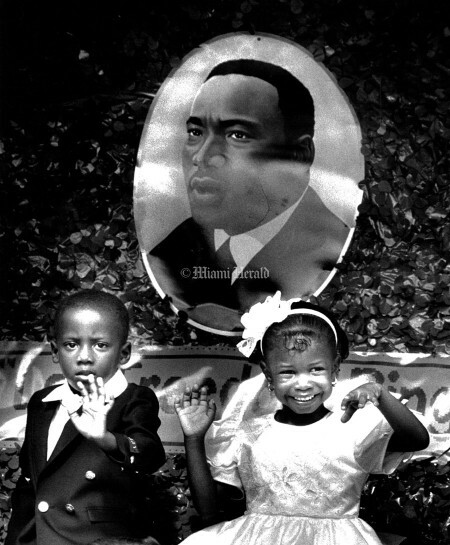 1/17/1984, C.W. 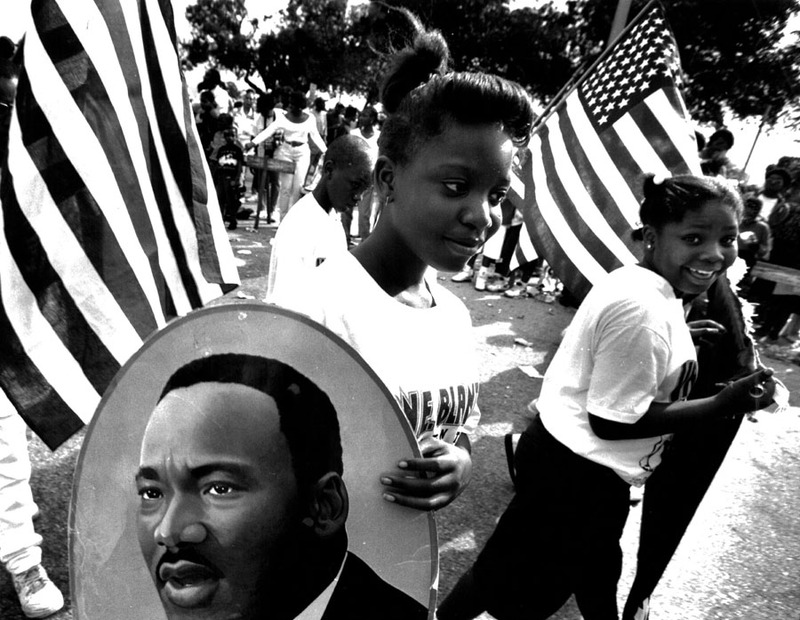 Griffin/Miami Herald Staff: Choicetta Newsome, a Brownie from Martin Luther King Eementary school is marching in the MLK parade Monday morning. 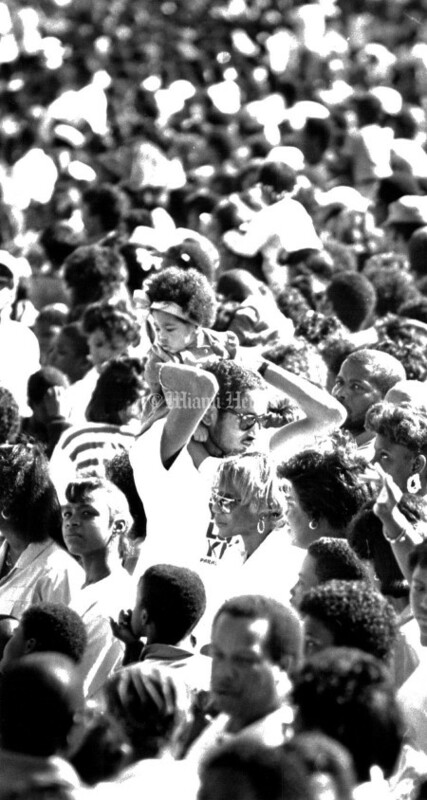 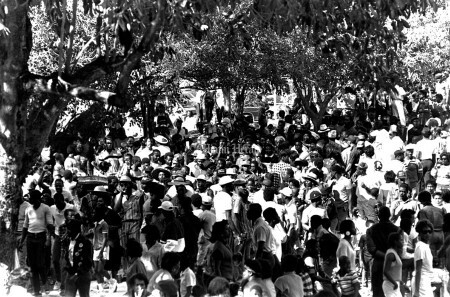 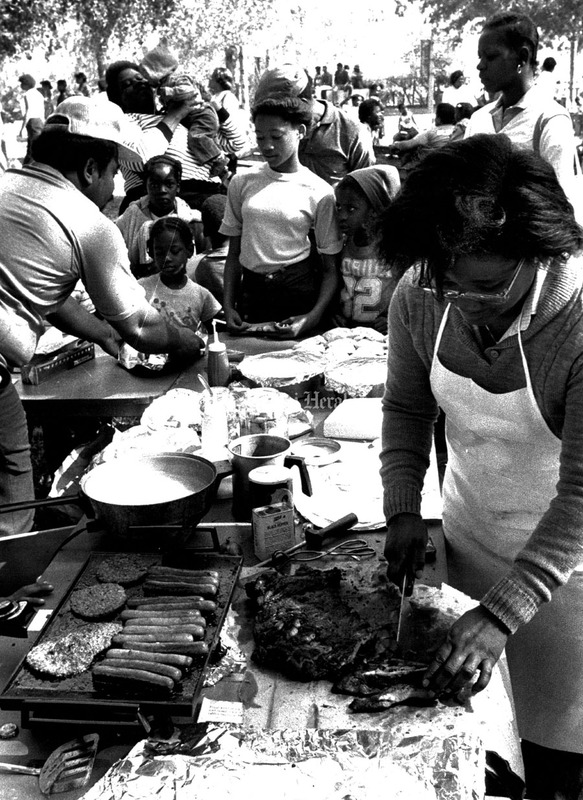 1/23/1986, Murry Sill/Miami Herald Staff: People enjoy the celebration at MLK Park. 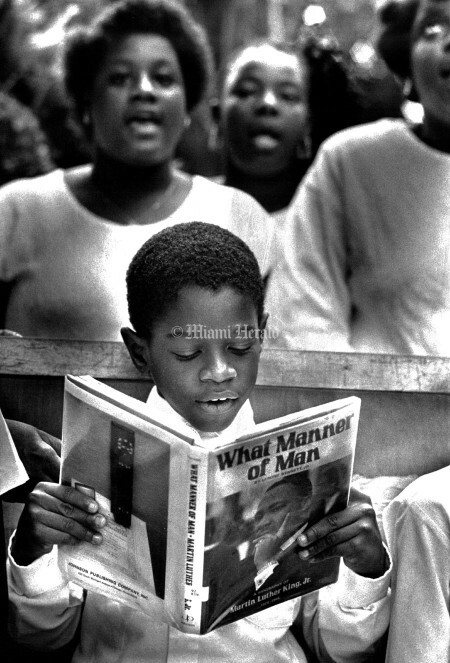 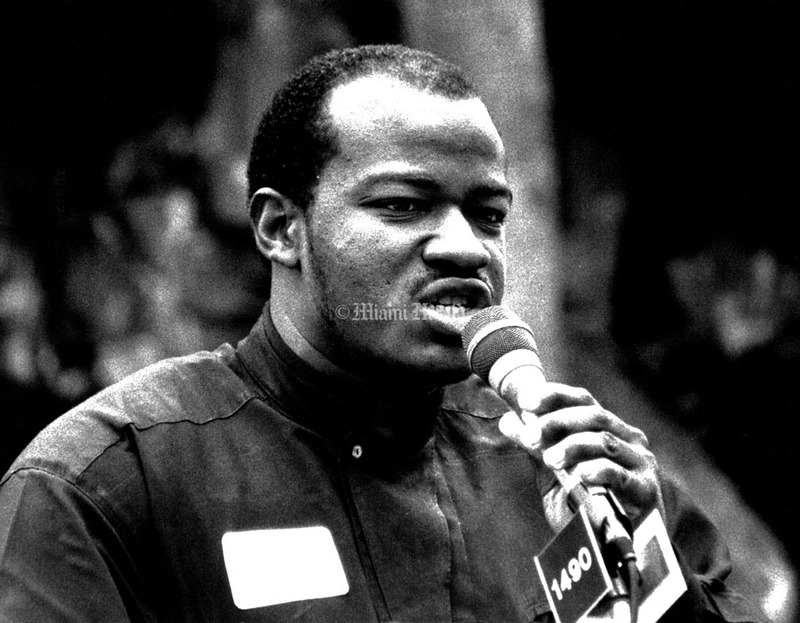 1/12/1989, Peter Andrew Bosch/Miami Herald Staff: Mark Smith who played Dr. Martin Luther king Jr. giving the "I have a dream" speech as part of the "keepers of the dream" program that was given at the Caleb center in Liberity City for a number of different schools. 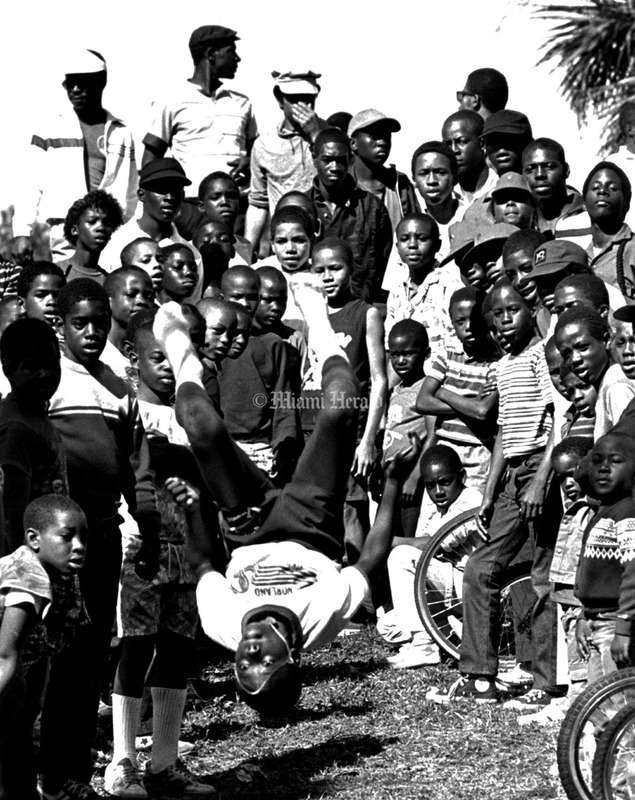 1/15/1989, Mike Stocker/Miami Herald Staff: L to R Lloyd Richardson, Edwin Wvans, Kiel Redding, (back row) Tanika Preston, Raeshawn Leak, Dachari Walker of Martin Luther King Elementary School in the M.L.K. Parade. 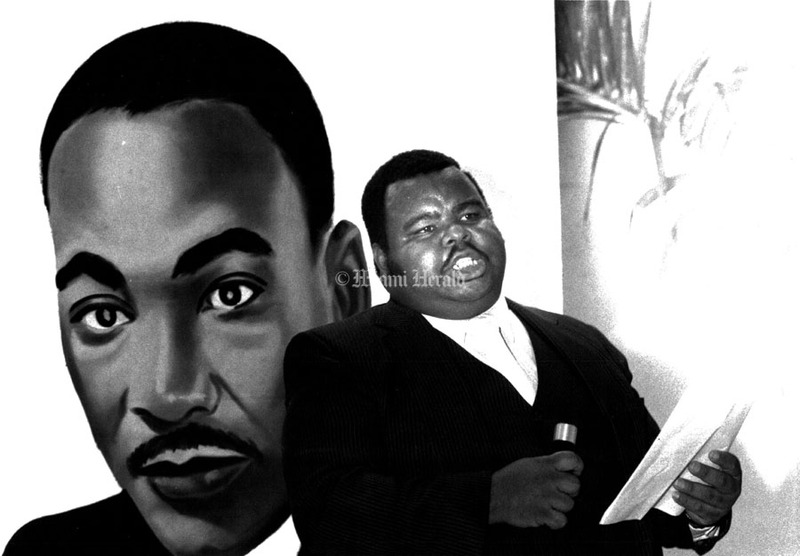 1/27/1990, Albert Coya/Miami Herald Staff: Dr. Martin Luther King Jr. oratorical presentations contest. 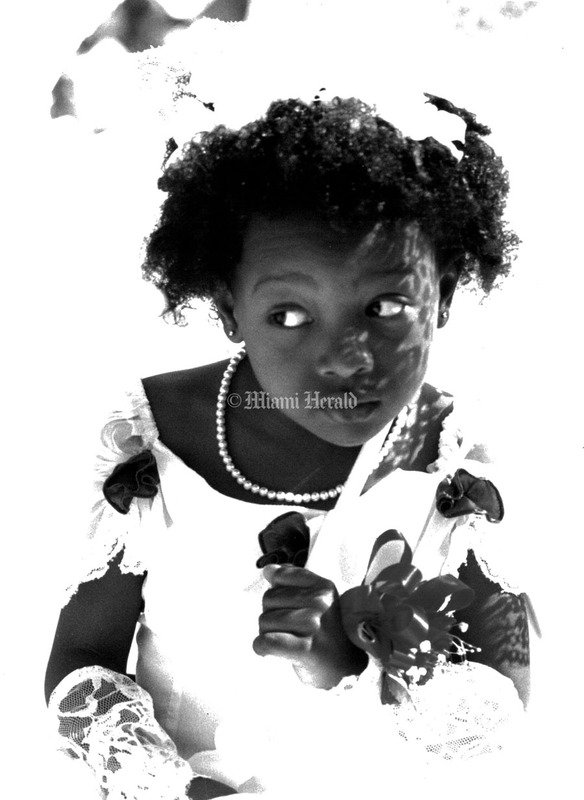 Winner of the young adults category was Johnny Ray Williams. 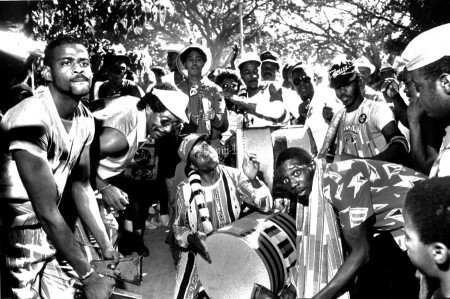 1/20/1986, Murry Sill/Miami Herald Staff: Bruce Beneby plays drums for the sunshine Junkanoos at the Martin Luther king day festival. 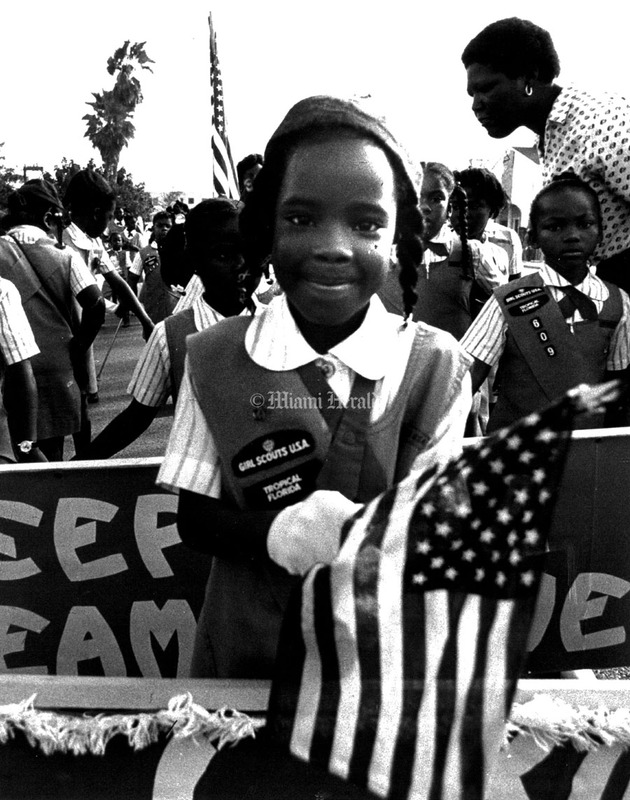 1/17/1994, Al Diaz/Miami Herald Staff: Annual Martin Luther King parade; Talanishia McCurdie, 10, marches along the parade route for Van E. Blanton Elementary school holding a poster of MLK. 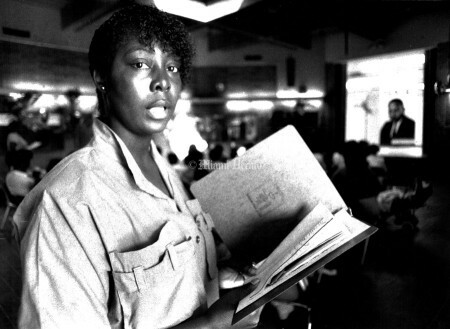 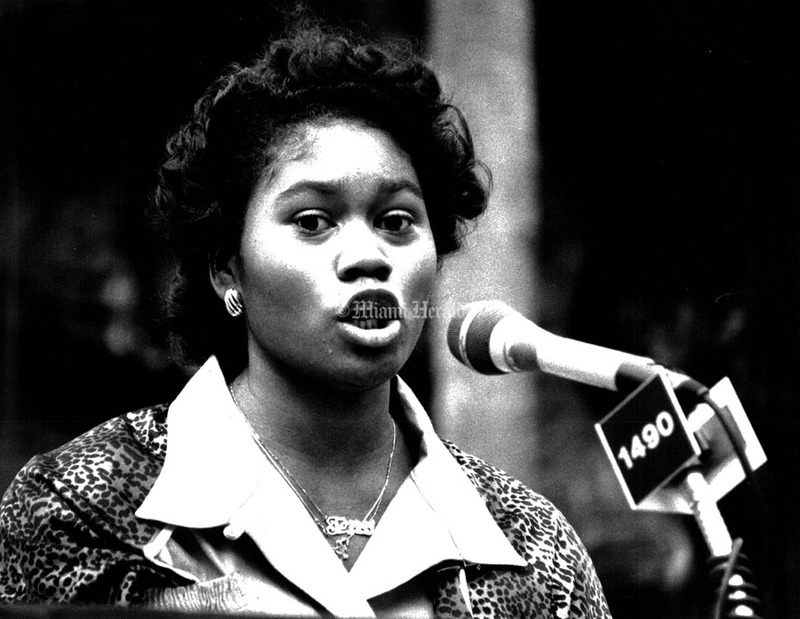 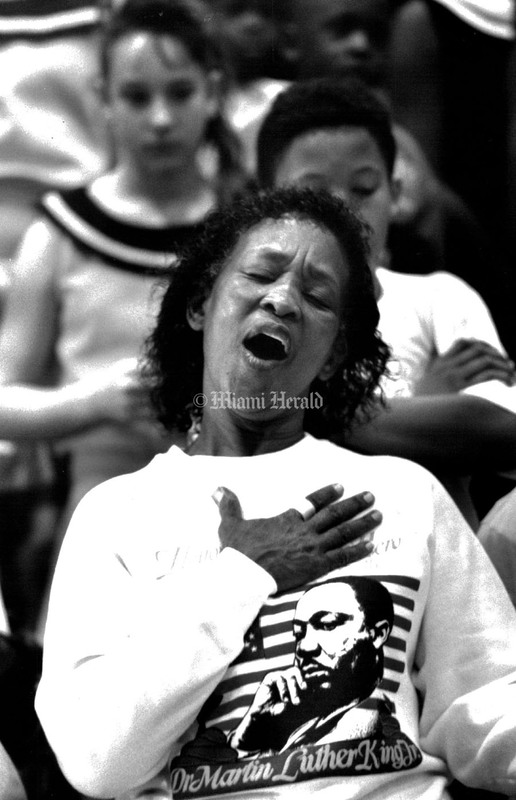 1/13/1994, A.Brennan Innerarity/Miami Herald staff: Andrea Williams listens to Yolanda King, eldest daughter of Dr. Martin Luther king Jr, speak in the high school's auditorium this morning. 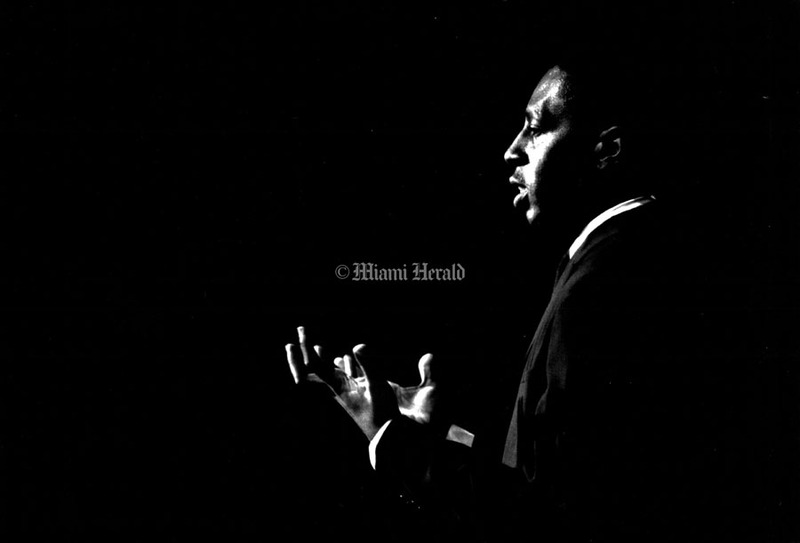 1/21/1991, Andrew Innerarity/Miami Herald Staff: C.P. of the rap group MC's of Rap. 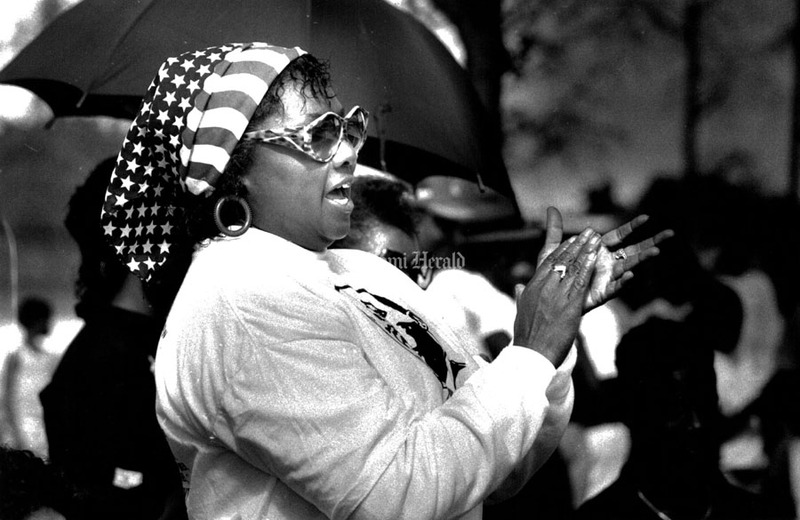 on stage early this afternoon at Martin Luther King Jr. Memorial Park. 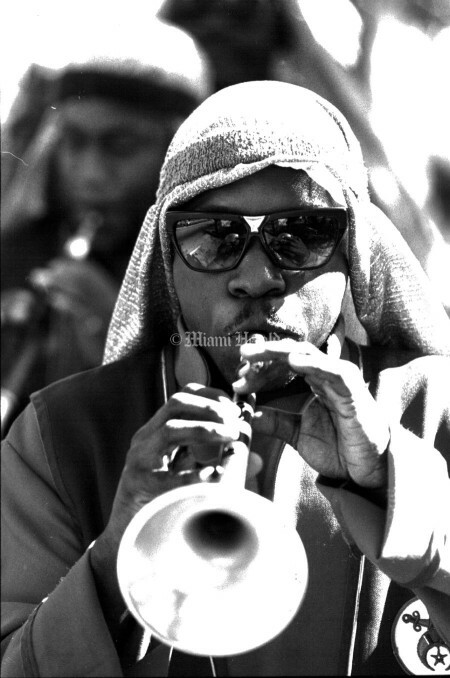 1/21/1990, Brian Smith/Miami Herald Staff: Alan Morley plays the muzette as he marches with the Kazah temple oriental band in the martin Luther king day parade. 1/17/1989, Brian Smith/Miami Herald Staff: Angelo Fulford, left, and Jody Swann carry faces of Martin Luther King Jr. during a parade in his honor through Liberty City Monday morning. The two were representing Trinidad and Tobago. 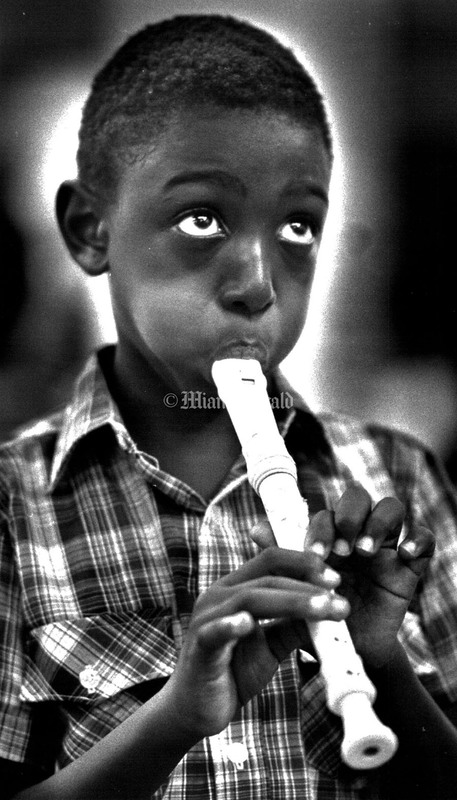 1/6/1983, Robin Shields/Miami Herald Staff: Philip Johnson, 7, plays the recorder while looking up at the conductor. 1/18/1993, Al Diaz/Miami Herald Staff: Hazel Evans, 16, Julian ford, 16, and James Ferguson, 16, dance along the MLK parade route. They are members of the Northwestern High School band. 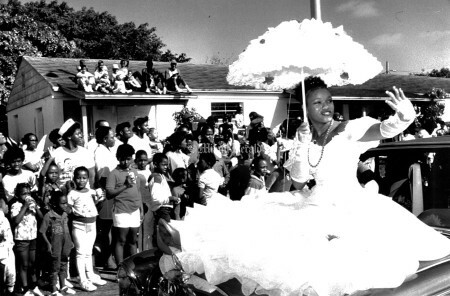 1/21/1990, Brian Smith/Miami Herald Staff: Vantrece Sullivan,3, holds a parasol above her head as she rides a float from Martin Luther King Jr. 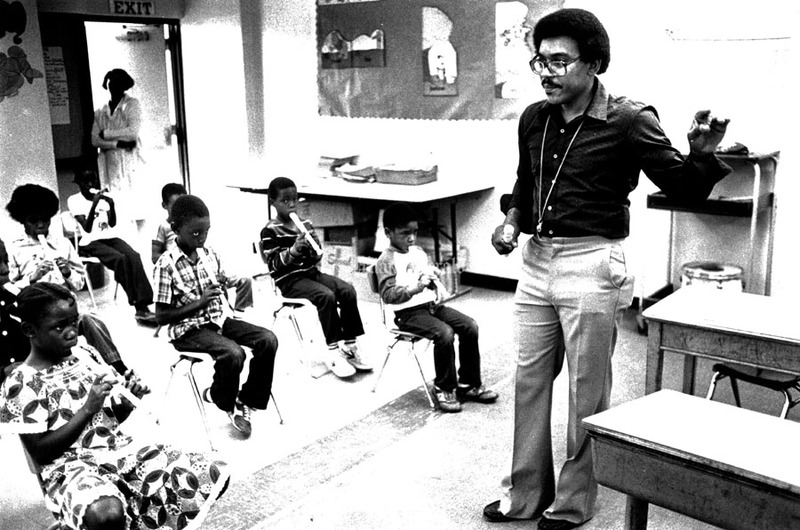 Elementary (where she is a pre-kindergarten student) along 62nd street. The parade started at 10th Ave. NW and ended at MLK Memorial Park. 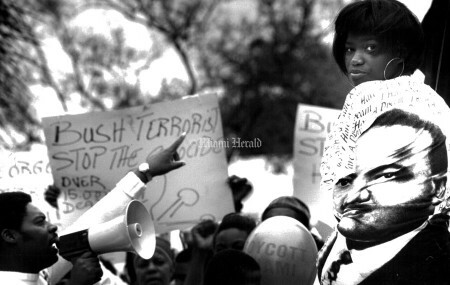 1/16/1989, Brian Smith/Miami Herald Staff: Herode Etienne marches down Martin Luther King Jr. Blvd. 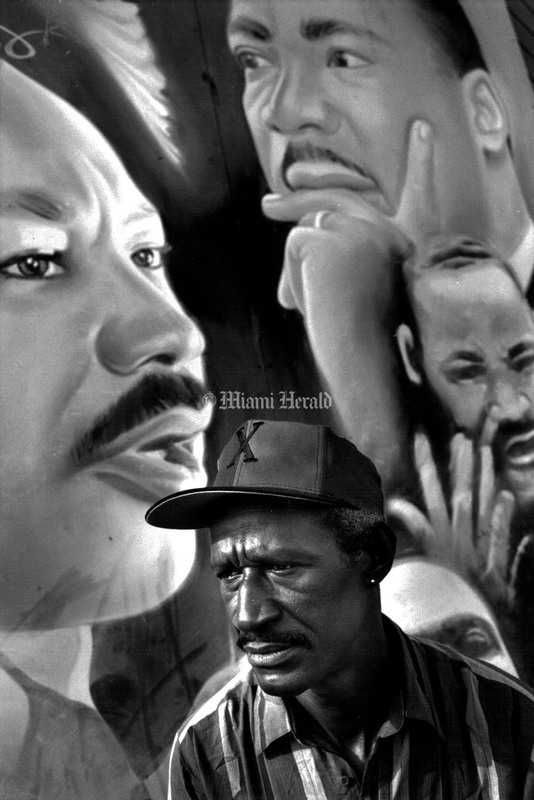 1/15/1993, A. Brennan Innerarity/Miami Herald Staff: Bill Green, who sells "Golden Oldie" tapes from his tables set up on NW 7 Ave Near 62 St in front of the Mural painted to honor Dr. Martin Luther king at the intersection of NW 62 ST and 7 Ave.
1/20/1985, Murry Sill/Miami Herald Staff: Youngsters show off their gymnastic abilities to each other at MLK birthday party. 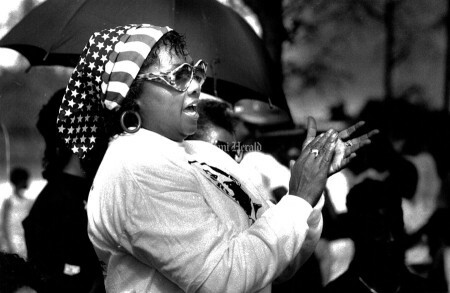 1/20/1992, Andrew Innerarity/Miami Herald Staff: Brigette Sharpton sits on the Jock & Jill Corp of America's Miami Chapter Float on the parade route that honored Dr. Martin Luther King. "Jack & Jill" is an after school child care program. 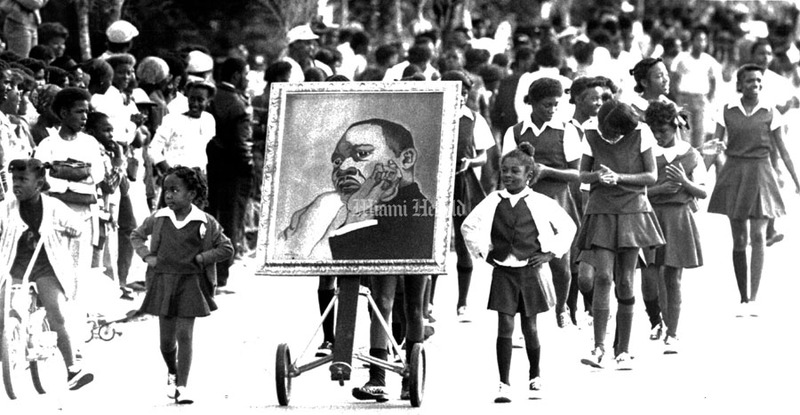 1/16/1983, Bruce Gilbert/Miami Herald Staff: Martin Luther King Jr. parade on 62nd St. Painting of MLK flanked by African Square Park Cheerleaders.